The EMC1815 is a 1.8V, 5 channel, high accuracy, 2-Wire (I2C compatible) temperature sensor. Advanced features such as Rate of Change, Resistance Error Correction (REC), Beta Compensation (to support CPU diodes requiring the BJT/transistor model), and Ideality Configuration combine to provide a robust solution for complex environmental monitoring applications. 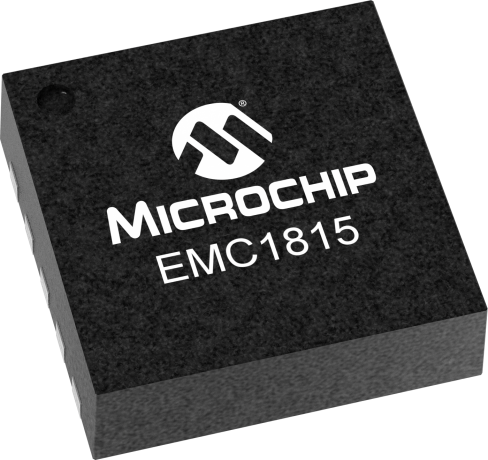 The EMC1815 monitors is the first device family to introduce rate of change functionality. This data, in addition to the temperature itself, facilitates a preemptive system f. This type of data can help customer better regulate their applications to control temperature. Resistance Error Correction automatically eliminates the temperature error caused by series resistance allowing greater flexibility in routing thermal diodes. Beta Compensation eliminates temperature errors caused by low, variable beta transistors common in today's fine geometry processors. This frees the user from providing unique sensor configurations for each temperature monitoring application. These advanced features plus ±1° measurement accuracy provide a low-cost, highly flexible and accurate solution for critical temperature monitoring applications.